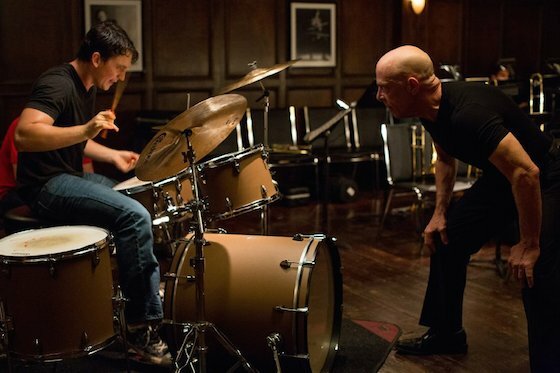 February 16, 2015, 1:01 AM · "There are no two words in the English language more harmful than ‘good job.’"
This is what the sadistic jazz professor Terence Fletcher (J.K. Simmons) tells young drummer Andrew Neiman (Miles Teller) during a defining scene in the Academy Award-nominated movie Whiplash, by way of justifying his cruel ways as a teacher. Naturally, I agree. But probably for different reasons than the fictional tyrant of a teacher does. For example, I do not subscribe to the idea that cruelly eviscerating a person's self-worth will spur that person to practice until his fingers bleed. In fact, on the topic of practicing until your fingers bleed -- I don't view it as the best path to developing surefire technique, sound musicianship and inventive self-expression. So what's my problem with teachers telling their students "good job"? It contains no helpful information. As people say of the over-use of expletives: "It just shows your limited vocabulary." You might think I'm joking, but I'm not. "Good job" is discouraging, disempowering, and it turns students into praise junkies. If a student aspires to a high level of musical accomplishment, he or she needs good feedback from teachers, colleagues and audience. But it needs to be specific feedback, positive and negative. For example: your high D was perfectly in tune and made the instrument ring; your bow thumb is placed correctly; you made that phrase so poignant; you did it the same both times, change it up; accelerate the vibrato there; that moment is so special, hold it longer; soften your hand for the double-stops; you are using too much muscle to go fast; the arpeggios were clean; slow the tempo three notches on the metronome; that decrescendo to niente chilled my bones; make the audience hold their breath by holding the last note as long as you possibly, possibly can. Students need to know what is working and what is not working, and they need the courage and tools to boldly implement changes where needed. They don't need, "Good Job." Did you ever have a violin teacher who used fear to motivate you? February 17, 2015 at 12:20 PM · Good job you think like that ... Whooooooops!!!!! February 17, 2015 at 09:57 PM · lol John! I wouldn't say I'm 100 percent all-the-time against ever saying "good job," just that a teacher probably should come up with something a little more helpful and detailed to say to a student. The question that the movie brings up is along the lines of, does the push for excellence justify abuse, cruelty and immolation of self along the way? I don't think it does. And yet even in my (thankfully) limited exposure to abusive teachers, I can see that sometimes it produces a good performance. But at a very high price. Not worth it, IMO. I'm still in the "Nurtured by Love" camp! February 21, 2015 at 11:44 PM · When I taught children in London, England in the 80's, if I ever said "good job," the mother would cringe. When I asked what was wrong, I was told that a "job" was ---how can I put this delicately? I can't. It's a bowel movement, and "good job" was said during a child's toilet training. Now I'M the one to cringe whenever I hear it, and I never said it again, naturally. I also believe in very specific compliments. February 22, 2015 at 10:03 PM · Many school music directors could have lived without this movie- we have enough trouble convincing people what we do matters without yet another negative portrayal. Thanks so much, Hollywood. February 22, 2015 at 11:17 PM · That is certainly a good reason to eliminate "good job"! February 22, 2015 at 11:49 PM · Hmm, suggesting that you should practice untill you bleed is actually indirectly admitting that you don't know how to suggest a more constructive way of practicing. Thus the teacher could need a brush up on how to practice. But it is a great thing to be passionate; that can be very inspiring. Regarding "good job": If you say "good job" to a student it should include what was good, then it would make sense, wouldn't it? Regarding praise: It depends on how you praise, like if you say to a student "your high D was perfectly in tune and made the instrument ring" that is in fact praising the student, isn't it?